Unfortunately, this time around my husband did not agree to wear the same two shirts for over a week and then let me take pictures of his collar grime to post on the internet. What a strange man. So I chose the next dirtiest thing in our house: a 100% cotton canvas drop cloth that we use to cover the couch and protect it from fur and muddy Corgi paws. You can click on all the pictures to enlarge them. 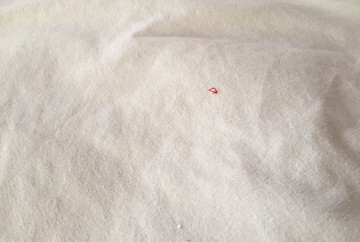 On top of that I figured what the heck, if Consumer Reports can do it so can I and added the following stains to the drop cloth and marked them with red stitches to identify after the wash: black currant jam (one vertical red stitch), ketchup (two vertical red stitches), mustard (three vertical red stitches) and olive oil (one horizontal red stitch). I rubbed the product deep into the fabric and let sit for about 30 minutes before laundering. The stains did not get pretreated in any way. 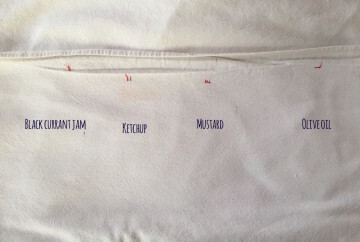 These were the food products I rubbed into the fabric: take that, Persil! And a closeup of the stains and corresponding red marks. Click to enlarge. To really test out the Persil ProClean 2in1 laundry detergent I used the same cycle as last time in my Miele W3038 washer: Wrinkle Free, Very Warm with a prewash. I used about half a capful of Persil ProClean 2in1 divided between the prewash and main wash. It took all the will power and self control I have to not add anything other than Persil ProClean 2in1 – normally with a load that dirty I’d have the big guns out. I’d definitely use at least an oxygen bleach, hot water and extended time, plus a heavy duty cycle like Custom or Extra White. But for this review I limited it to only the 2in1 and a fairly gentle cycle. I chose an average wash cycle to really test out the cleaning power of Persil ProClean 2in1 – normally I’d run a much more heavy duty cycle! This was the dirty muddy area from the first photos – I later marked it with a red triangle. Also all clean! As you can see, there is a faint mark left where the ketchup stain was, but everything else is completely gone. Not a sign of the dirt and nothing left behind from the jam, mustard or olive oil. 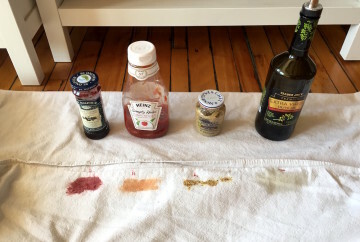 Looks like the ketchup could have benefited from a little bit of pretreating (or a longer wash cycle), but overall I think the results speak for themselves. 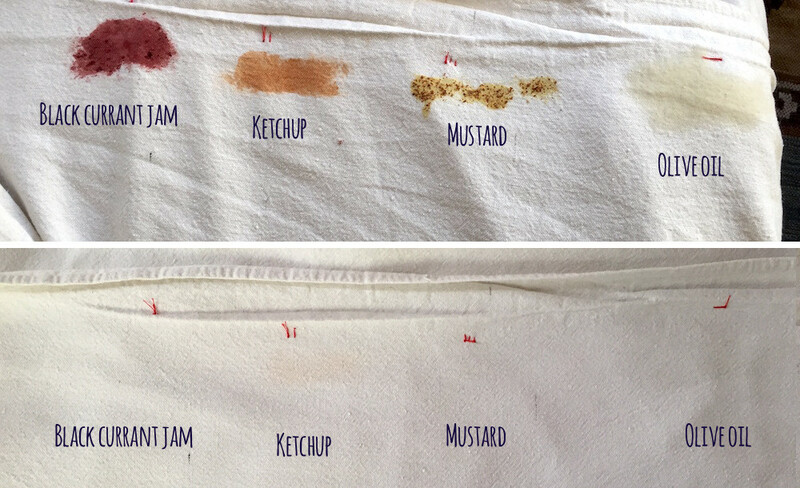 I was especially surprised that the mustard came out completely – usually that one’s tough. 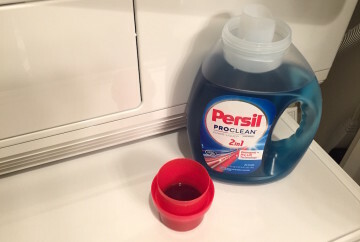 To sum things up, I think that Persil ProClean 2in1 performed very well on a variety of stains – so if you are looking for a heavy duty detergent and don’t mind the lingering scent this is a pretty good option. Consumer Reports rated it above Tide this year, and they put detergents through much more rigorous and controlled testing than I will ever be able to do. By the way there is currently a $2 off printable coupon available on coupons.com! And Persil ProClean is no longer exclusively sold at Walmart – you can find it at a bunch of different drugstores and supermarkets. Now a little about the Persil ProClean 2in1 detergent. It is a thick blue liquid/gel – in fact it’s so thick that it doesn’t always wash out of the prewash dispenser well if I use the liquid insert. Because of this I prefer to not use the insert and pour it in the same way I add powders. It has a fairly strong scent that stays on clothes. It also contains optical brighteners (OBAs) and five different stain fighting enzymes. Speaking of scent, one of the things that I noticed when browsing the Persil ProClean facebook page this time around was that there were pretty much no complaints about sour smells remaining in the laundry. When Persil first launched that seemed to be an issue that some people were experiencing, and there were plenty of complaints on facebook and even in my blog comments. While I personally did not experience this issue, the sheer volume of identical complaints made me think that there was something in the ingredients that was reacting with either the water chemistry or the other products (fabric softeners, etc.) that people were using with the Persil ProClean. Whatever the reason of the sour smell issue, it seems that some tweaks were made and now it is no longer bothering people. Nowadays the most common complaint on is… the pouring spout. Once again from facebook I learned that they are in the process of redesigning the bottle to eliminate this issue, but in the meantime the spout can just be pulled out to get the last bit of detergent out of the bottle. And now, without further ado, the first laundry-themed giveaway on Olga’s Laundry Blog: enter to win one of three coupons for a bottle of Persil ProClean laundry detergent (max value $5.25)! This giveaway is open only to residents of the US ages 18 and up. To enter, start by sharing in the comments what are some of the toughest stains you have to deal with. Giveaway will end at 11:59 p.m. EST on February 19, 2016. This giveaway is open only to residents of the US ages 18 and up. The winner will be selected by random.org and will have 48 hours to respond or another winner will be chosen. THE PERSIL BRAND KINDLY PROVIDED ME WITH SAMPLES OF PERSIL PROCLEAN 2in1 LAUNDRY DETERGENT, HOWEVER ALL OPINIONS EXPRESSED ARE MY OWN. Sue, do you not like the fragrance or are you having sour smell issues? I cannot stand the fragrance. I also have the same issue with dryer sheets, room sprays, synthetic perfumes etc…I’m very sensitive to artificial fragrances . Persil has got to be one of the worst for me. It is a bummer because it does work well. If I use less my clothes do not get clean. The hardest stain is blood. Persil ProClean removed it. Chocolate and oils are the hardest to remove for me. For me makeup stains in face cloths are the worst! Especially waterproof mascara, yuck. Ketchup & perspiration stains are the most difficult stains to eliminate. Spaghetti sauce seems to be pretty tough to get out for me, I have to pretreat and let it sit for days for purex to get it out. 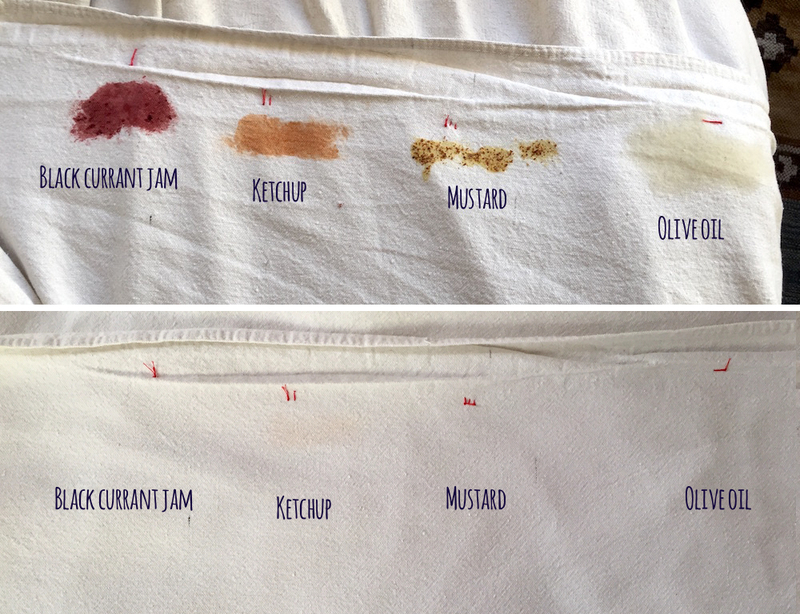 The toughest stains I have had to deal with are grease and berry stains. 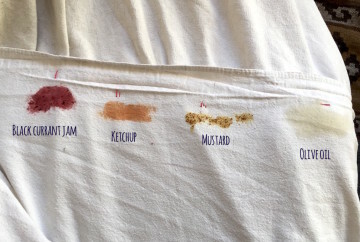 Some of the toughest stains I’ve dealt with include ketchup, mustard, grease, grass stain and perspiration. Heard about this on the Super bowl- can’t wait to try it. 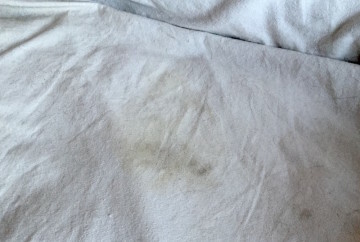 the toughest stain- oily smears- my husband was repairing our truck… Persil did a great job! I’m constantly having to get oil/grease stains out of my husbands clothing. Its the worst!! Toughest stains for me have been grass and oil stains. My worst stains are perspiration and whatever the kids have on the bottom of their socks. Also general odor removal has been an issue. Have been tempted to try this, glad to see you had such great results!!! I’ve had to deal with blood stains and poop stains. YUCK! Persil Power Pearls got my son’s nasty socks white again! 1. I cannot stand the smell of Tide. I find it very strong-like someone poured a bottle of perfume on my clothes. Is Persil like this? 2. I have read that powder detergents are better in front loaders, and that liquid detergents leave behind residue, especially on the gasket. What are your thoughts on this? 3. I have always wanted a Miele washer, and I finally have one. I know that keeping the gasket from getting “gunky” can be tricky, which is why I am concerned about the powder vs liquid question. Any suggestions are most appreciated. I know that I need to keep the door open while it’s not in use. I also have a Miele washer and agree with everything you said. They do not make/import the 220v version of my washer to the US anymore so I do not want to gunk up my machine…I’m sticking with powders…except for delicates. I can tell you this…the Persil liquid has a very strong fragrance :-(. I cannot use it for that reason. There really is no reason to avoid liquids, as long as you are following all the proper maintenance steps, but many people actually prefer powder and find it cleans better. So whatever works best for you! I have detergent attachment issues, so I like to mix things up. 🙂 And recently I’ve been playing around with using different types of detergent for the prewash and main wash in the same cycle – usually liquid in the prewash and powder for the main wash, or vice versa. The good news though is that the Power Perls (powder) and Sensitive (liquid) leave a lot less scent behind. I actually haven’t yet tried the Sensitive because it only comes in a large 64 load bottle, but have smelled it at a grocery store and thought the scent was pleasant and super mild compared to Original and 2in1! Sorry I’m rambling here and have typed such a long answer to such a simple question, but I think your best bet would be to try smelling the Persil Original and 2in1 in a store and if you don’t hate the scent, find a high value coupon and try out a small bottle (or enter my giveaway! 🙂 ). 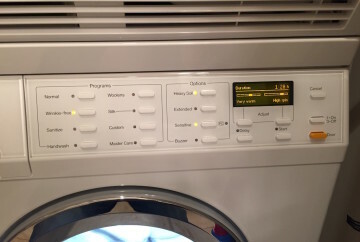 And don’t forget to activate the Sensitive option on your washer which adds an extra rinse to most cycles if you’re sensitive to scent, as well as playing around with just how little detergent you can get away with using (the machines are so small, you really don’t need to be following the “lines” that manufacturers recommend). 2. This really isn’t an issue if you care for your washer properly. The horror stories you see 99% of the time come from households that wash only on cold with liquid (usually overdosing the detergent), use a ton of fabric softener and keep the door of the machine shut when not in use. I’ve seen several gunked up machines at airbnbs we’ve been to, and believe it or not every single time I was able to clean those up by running a couple of hot maintenance washes and keeping the door open. I have been using The Laundress detergent for a while. I think I may try using a powder detergent from time to time. Has anyone tried Miele’s powder detergents, and if does anyone have any feedback? The Miele detergents are great – comparable to German Persil in terms of performance, but with a much lighter scent. I personally use the Miele UltraColor and really like it! I haven’t tried the UltraWhite yet, but have heard nothing but good things about it. They also have a lightly scented Sensitive option. 1. I tried the Miele UltraWhite and Sensitive detergents and I really like them both. 3. The UltraWhite definitely has stronger scent out of the box and the Sensitive less so. I pulled each detergent out of their respective boxes and put them in 1 gallon zip lock bags and them put them back in their boxes. This has helped with me noticing the strong scent when I open the closet where they are stored. 4. The detergent is very fine- almost like powdered sugar- so it dissolves nicely. Yeah! 5. I have some very nice, but sadly dingy white bath towels that I was hoping to restore to their former super white glory. Unfortunately, the UltraWhite did not quite to the trick. And I added oxygenating bleach. I have not given up yet!! The UltraWhite has been great on all my other whites. So really no complaints. 6. My long time prior detergent has been The Laundress-which I still like. I did not notice needing fabric softener with this brand. I may need to use some with the Miele detergents. 7. All of my loads of wash have been done in my new to me Miele- which I LOVE. 8. Thank you for this blog, so that people like me learn about all the great options when doing laundry. 9. On a side note- The gasket- I picked up a microfiber cloth at Trader Joes which I use to wipe out the inside of the gasket after I am done doing laundry for the day/night. I am hoping this will help with the “GUNK” factor. Thanks so much for the update and your kind words, Monica! I’m very happy the MieleCare detergents are working for you! And yes, I think you’ll find that powders generally leave clothes less soft than liquids (I blame the zeolites and sodium carbonate in the ingredients list), but they also tend to be better at removing most stains with the notable exception of oil. Liquid works best for oil stains. As for the dingy towels, are they all cotton? And how have you tried tackling them so far? I have had some luck with oxygen bleach and overnight soaks in very hot water, but some towels become rough after being exposed to super high water temperatures… So I guess it also depends on just how much risk you’re willing to take to get them back to bright white. A pair of shorts me brother had gotten truck grease on then washed and dried several times. He drives truck and ask me to wash his clothes while he was in town. I did my voo-doo and got the stains out (Zote Soap). Ketchup and red wine are some of the worst stains I have ever seen. Very difficult to get out. I hope I will one of these coupons so I can try Persil and see if it can remove these tough stains! We have one of those ill-fates American mieles.. (4800). Seriously it’s great as long as you leave the door/dispenser open! We used to use the German megapearls and everything was good for years and years. (regular and the colour type). Tried tide ewww. Now…the Italian supermarket (Coppas/Highland Farms) has the universal Persil (non Pearl) 70loads for $35 on sale. They also have the colour one. I used to use 1tbsp for a medium load… So I got quadruple the load value out of the powders. I also know I can get the NA Persils pretty much everywhere… Its about $7/20 loads for the 2in1. I am leery about liquids in my front loader, but I have atrocious body oil stains on (one side of) my sheets so I want at least one heavy duty product. 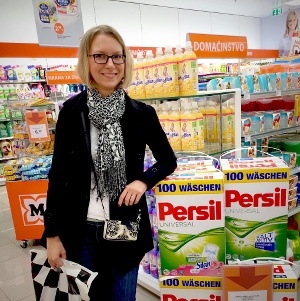 You are extremely knowledgeable about Persil and you have a Miele too… What would you recommend I purchase? Just get the German powders for normal laundry and the 2in1 for especially filthy clothes? I imagine the stores will stop carrying the German Persil soon so if it is still the best at cleaning I want to stock up. I think you’ll still be able to find German Persil on Amazon (that’s how I always purchase it), so I wouldn’t be too concerned about losing access to it forever. But with the types of oily stain that you mention liquid detergent and HOT water are key, so I think you might really like the 2in1! One thing to keep in mind is that the liquids are quite sudsy, so especially if you have soft water (I’m assuming you do, since you’re able to get away with just 1Tbsp of detergent) you’ll have to be careful with the dosage. Here’s what I’d do with bedding with bad oil stains: prewash with Persil powder (about 1/3-1/4 of what you use for a full load), then wash on Very Warm or Hot with about 1-2 Tbsp of Persil 2in1. If you’re able to open the door during the main wash before it locks up, I’d throw in a dose of oxygen bleach too. If you start getting crazy suds, pour some diluted fabric softener in – that will kill the sudsing. Hopefully that will help get rid of the existing stains, and you’ll be able to just maintain clean sheets going forward. Actually, you could try that same process with the powder you currently have, maybe up the dosage for the main wash to see if it will make a difference before you go buying the liquid. 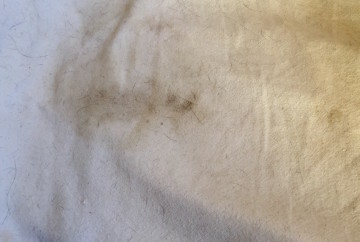 If you wanted to share more about how you wash these sheets I could brainstorm with you to see what else can be done – Miele washer owners should not have atrocious stains! I purchased the Persil ProClean original product. I washed a load of dark colours and the Persil left white white streaks on a lot of my laundry. I ended up rewashing most of it with Tide. Also I don`t like the strong fragrance of this product. I was a passenger in my sisters ca, wearing freshly washed clothes. She wanted to know what the smell in her car came from. I am not a fan of this new product. Thanks for sharing, Irmina! Was it the Original Liquid that you used? That makes me think of dosing issues – the white streaks would be excess detergent that did not get rinsed out.